Experience your special celebration at Bad to the Bone BBQ’S state of the art Event Center. Let us help you create treasured memories that will last a lifetime. You and your guests can enjoy our outdoor cocktail reception patio and our 1,700-square-foot banquet room complete with a full bar. The room can accommodate up to 100 guests, or 80 guests with a dance floor or 125 as a cocktail party. Our Event Center provides the perfect setting for your special event. With an authentic, rustic-style atmosphere, it’s ideal to host your company party, wedding, rehearsal dinner, team or school fundraisers or create your own specialty-themed get together for family and friends. We, of course, will provide our famous BBQ fare. Looking for other options? Our stellar culinary team is experienced and trained to prepare a multitude of various cuisines and can prepare a custom menu for any occasion. 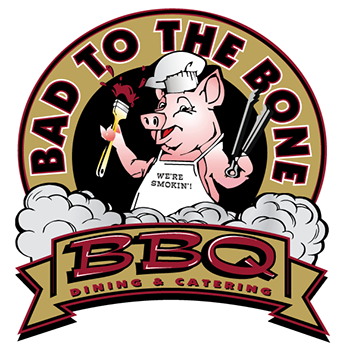 At Bad to the Bone BBQ, our goal is to make your banquet or event a memorable and relaxing experience that you’ll cherish and remember forever. We take great pride in our atmosphere, Event Center, customer service and well-trained staff; we trust we will meet all your expectations. The entire Bad to the Bone BBQ team looks forward to welcoming you to Bad to the Bone BBQ and making your event truly spectacular.